Dr Jon Copley, Associate Professor in Ocean Exploration & Public Engagement at the University of Southampton and a scientific adviser for BBC television's Blue Planet II, assesses the oceans of information available about life beneath the waves. “The ocean: the largest habitat on Earth” – those words, spoken by Sir David Attenborough at the start of the “prequel” to Blue Planet II, capture the scope, focus, and justification for the BBC Natural History Unit’s latest landmark series. Over the past two years I’ve been a scientific adviser on some of the topics covered in a couple of episodes, while colleagues at the Open University have been academic partners for the whole series. And lines like that in the prequel can certainly be a head-scratcher for academics like us who fact-check these programmes. The oceans cover 71% of the surface of the Earth, so seafloor provides the largest area for those species that move about on or are rooted to our planet’s surface – a reasonable justification for the “largest habitat on Earth”. But what about lifeforms that aren’t confined to dry ground or the seabed, those that can swim, fly, drift in wind or currents, or even thrive below the planet’s surface? The average depth of the ocean is 3,682 metres, so taking 71% of the Earth’s surface with that average depth gives us an estimated volume of 1,332 million km³ for the oceans. And there is life swimming or drifting throughout that vast volume, even to the bottom of the deepest trenches nearly 11km beneath the waves. These trench-dwellers are not the deepest lifeforms on our planet, however, as a “subsurface biosphere” of microbes permeates even further into the Earth’s crust. There are microbes living 2.5km below the ocean floor, for example, in coal-bearing sediments. The depth limit for such subterranean life depends on local geology, however, and even assuming a limit of 2.5km all around the world gives us a “subsurface biosphere” of around 1,275m km³. That’s smaller than the oceans, and furthermore not all that volume is habitable, as the microbes are squeezed into spaces within the rocks. There are also microbes in atmosphere above our heads, living in water droplets and on ice crystals in thunderclouds, up to an altitude of at least 12km. But before we imagine a layer 12km high for microbial life in the skies, it’s worth remembering that they need a watery environment in which to thrive. Only around 0.4% of our atmosphere is water vapour, so the aerial habitat for microbial life is much smaller than we might think. What about the aerial habitat for birds, bats, flying insects, and tiny animals? Bar-headed geese may fly at an altitude of more than 8km in the Himalayas, but they don’t actually fly 8km above the ground – they follow the terrain of the mountain range as they migrate over it. So it may be wrong to assume a layer 8km high for the aerial habitat of animal life around the world, as there are few mountains rising to those heights. In November 1973, however, an aircraft flying at an altitude of 11km over the Ivory Coast collided with a Rüppell’s Vulture, which holds the record for the highest known bird. As this took place over the coast, with no mountains below, we might therefore assume a layer at least 10km high for animal life in the atmosphere, all over our world, which would give us an astonishing potential habitat of 5,100m km³ for airborne animal life. So at this point, our blue planet is perhaps starting look like a very airy one too. Where the ocean pips it, though, is in the abundance of life that it harbours. Microbes utterly outstrip animals and plants as the dominant form of life on Earth, in their individual numbers and total biomass, so it’s their abundance that matters here. And while living microbes are restricted to watery spots in the atmosphere, they face no such limitation in the ocean. A single millilitre of surface seawater naturally contains around a million living bacteria and other kinds of single-celled microbes. Although that concentration drops off to perhaps 10,000 microbes per millilitre in most of the deep ocean, the total global population of microbes in the oceans is staggering: about 44 octillion living cells (or 44,000,000,000,000,000,000,000,000,000 if you prefer). That number is literally beyond astronomical: it’s around ten thousand times the number of stars in the observable Universe. So the oceans are certainly “the largest reservoir of life on Earth”. Is that the same as “the largest habitat on Earth”? The oceans really contain lots of different habitats, of course, from lush kelp forests to huge expanses of open water. 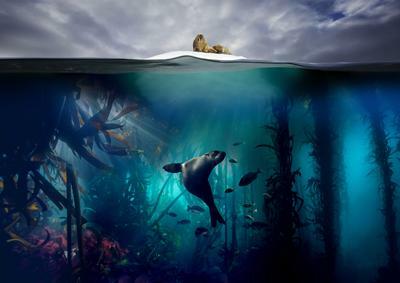 Blue Planet II celebrates that reality in its forthcoming episodes, exploring places such as sunlit coral reefs and bizarre deep-sea brine pools, so I’m comfortable with that “largest habitat” shorthand in its opening line. After four years of work by a small army of producers, camera people, sound recordists, editors, researchers, organisers, ship crews, minisub pilots, and scientific advisers, it’s time to immerse ourselves in the wonder – and realise how we are connected to that vast reservoir of life. Click here to find out more about Dr Jon Copley's research and ocean-going experiences. There's also more information on how the University of Southampton is creating a sea change around the world.